Here is another card I made for this challenge. I tried to do the crackle effect on the stamped image, but after adding layer, upon layer, upon layer, I couldn't get it to crackle. Obviously I was doing something wrong. Anyway hope you like it. I have been dying to make something with the Candlelight Christmas Fabric which is in the Holiday Mini Catalogue, found this pattern in one of my many patchwork books, pretty cute eh! I am off to make another one as you can't just have one placemat! The projects you can make with this fabric is endless, so if you would like to order any just drop me an email. I may even have to do a class on this one. 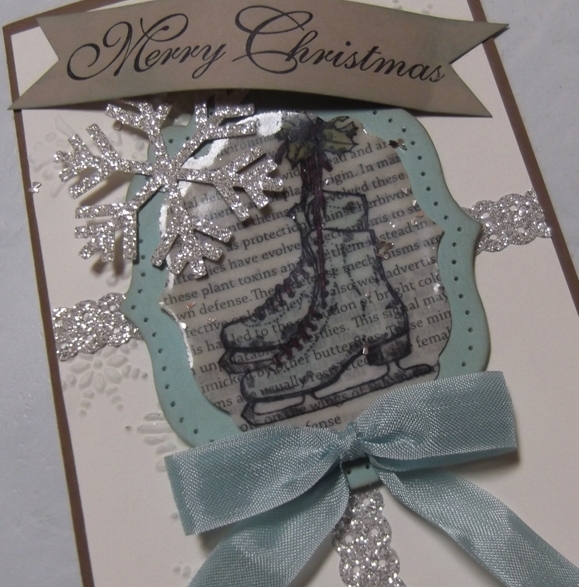 Gee I am doing good, another card made for this challenge, whoo hoo! Accessories: Brocade Embossing Folder, Modern Label Punch, Organza Ribbon, Taffeta Ribbon Whisper White. This is what we made in last Friday's class. Lots of great little projects using Patio Party Designer Paper. Just love the Petite Purse Die, so very cute. Two of the designs I used were from a tutorial by Becky Roberts' site Inking Everything With Becky, so as much as I would like to say I designed all the projects I didn't , I used two of her designs. The card that opens with the prezzies inside is one I have seen on the net a few times, I got my idea though from LeeAnn Greff. Cardstock: Whisper White, Summer Starfruit, Primrose Petals, Baja Breeze, Midnight Muse, Basic Gray, Patio Party Designer Series Paper. Modern Lable Punch, Boho Blossoms Punch, Scallop Edge Punch, 1 3/4 circle punch, Adorning Accents Folders, Delicate Design Folders, Polka Dots Embossing Folder, Petite Purse Bigz L Die, Pearls Basic Jewells, Silver Mini Brads, Dimensionals, Glue Dots, Snail Adhesive. It has been so long since I have had a chance to enter a challenge with Creating Pretty Cards, finally found the time to make one. 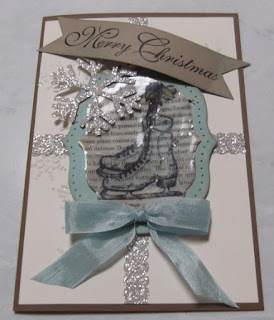 I got this idea from Kristine McNickle she did some fantastic designs using the Core'dinations cardstock, I just had to make something using it myself. Whisper White Bakers Twine, Whisper White 1/4" Stitched Grosgrain Ribbon, Woodgrain Textured Embossing Folder, Holiday Collection Framelit Dies. I made this card for another challenge with Becky Roberts' Inking Everything with Becky. Ink: Stazon Black, Gumball Green, Raspberry Ripple, Primrose Petals, Soft Suede, Crumb Cake, Early Espresso. Accessories: Fancy Fan Embossing Folder, Big Shot, Large Pearl Basic Jewels, Victoria Crochet Trim, Cherry Cobbler Seam Binding, Champagne Glinmmer Paper, Aqua Painter, Sponges, Blender Pen, Scallop border Punch,Labels Collection Framelits, Festive Paper Piercing Pack, Paper Piercing Tool, Whew! I have to add that my new favourite colour is RASPBERRY RIPPLE!